Thruxton Motorcycles Tygerberg is headed up by Adrian & Garth Brandon-Podd of the UK. The two brothers from England have been motorcycle mad since before they can remember. They spent thier youth working on bikes in the family garage, so naturally opening a motorcycle shop was the next step. In 2010 they joined forces in beautiful South Africa, and with the combination of businessman Fanie Swanepoel, the trio were able to achieve thier dream. 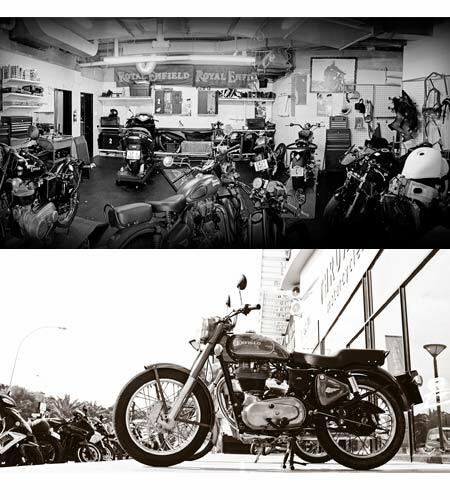 After much researching and homework, Royal Enfield, was chosen as the brand to launch Thruxton Motorcycles in early 2011. Since then Thruxton Motorcycles has housed brands like Benelli, TVS, Puzey, Keeway, and Megelli. In 2014 Thruxton Motorcycles became an Official SUZUKI dealership which in turn has given bikers in and around Cape Town more love and exposure to the suzuki brand! Thruxton Motorcycles Tygerberg is situated on the corner of Durban road and Bloemhof street in Bellville. Fellow bikers enjoy sipping on a coffee from the Vida e Caffe next door and talking bikes. Thruxton Motorcyles thanks all of our customers for their continued support throughout the years!